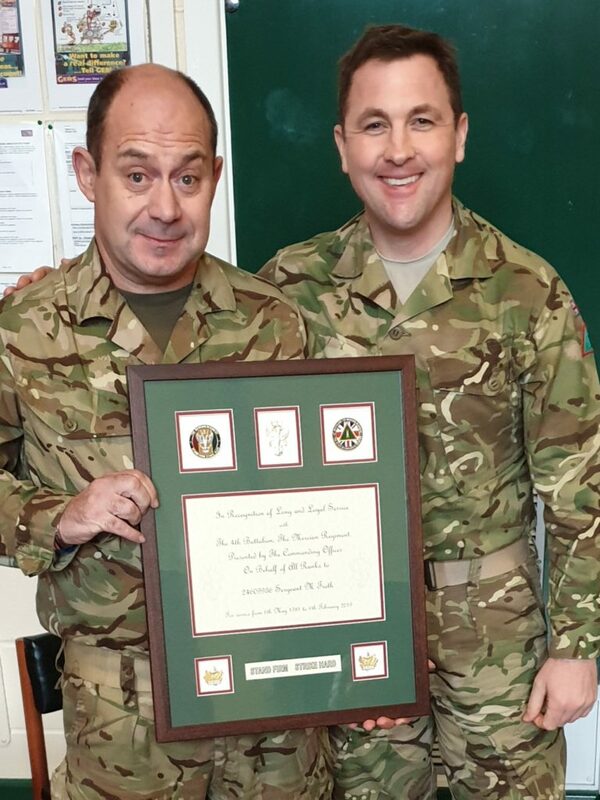 An Army Reservist from Bromsgrove will wind up his military service this week after a career spanning almost four decades. Sergeant Mark Troth, from Charford, Bromsgrove, joined what was then the Territorial Army aged 17 in 1981. During 38 years as an Army Reservist, Sergeant Troth has deployed on operations to Iraq in a combat role and to Cyprus as part of a UN peacekeeping force. He has also taken part in military exercises in Kenya and Croatia. Mark has helped to train and mentor hundreds of Army Reservists throughout his career. Mark says, “I am particularly proudly of helping so many young recruits, who had little or no experience of the Army when they first joined The Mercian Regiment, gain skills for life and be ready to serve their country with absolute commitment and integrity. Sergeant Troth’s long and loyal service was marked last week with a special presentation ceremony at the Army Reserve Centre in Kidderminster where he enjoyed breakfast with colleagues before the Commanding Officer, Lieutenant Colonel Fraser Cuttle MBE, presented him with a bespoke framed memento and a coveted Commanding Officer’s Coin. The presentation took place on Thursday 31st January. Married to Sue for 19 years, Mark has five children and six grandchildren. When he leaves the Army on his 55th birthday this Friday (8th February) he plans to spend more time with family and doing some part time driving to keep busy.